L-Tryptophan Review | Does L-Tryptophan Work? L-Tryptophan is an essential amino acid for all mammals, humans especially. For supplementation purposes, L-Tryptophan is produced industrially through a biosynthetic process, usually involving bacteria which synthesize L-Tryptophan naturally on their own. 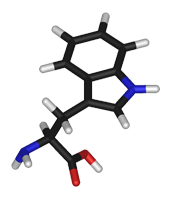 L-Tryptophan is so important to humans that it is encoded into our genetics (denoted by the symbol UGG). Because the human body cannot produce L-Tryptophan on its own, it is necessary for people to obtain L-Tryptophan from their diet. If an individual cannot ingest enough L-Tryptophan from the foods they eat, supplementation may be necessary. In the 1990's, L-Tryptophan was recalled due to safety concerns after a large outbreak of EMS (eosinophilia-myalgia syndrome) resulted in almost 40 deaths. However, it should be noted that the outbreak is thought to have originated not from taking L-Tryptophan itself, but from a contaminated batch produced by a Japanese manufacturer. Symptoms of EMS include severe muscular pain, fatigue, changes of the skin, nerve pain, rash, baldness, and swelling/pain on connective tissue, joints, liver, lungs, and heart. If you take L-Tryptophan and experience any of these symptoms, contact your doctor right away. Generally, however, L-Tryptophan produces mild to moderate side effects such as stomach discomfort, heartburn, gas/belching, vomiting, nausea, loss of appetite, diarrhea, headache, dizziness, dry mouth, drowsiness, muscle fatigue, blurred vision, and sexual dysfunction. Women who are pregnant or breast-feeding should not take L-Tryptophan, because it will likely harm their baby. How Does L-Tryptophan Help Brain Function? L-Tryptophan can have indirect nootropic effects by elevating your overall mood and enhancing the quality of your sleep, allowing you to focus better during the day and work more efficiently while awake. L-Tryptophan is the building block of an essential neurotransmitter called serotonin, the main chemical responsible for regulating good moods within your brain. Most chemical antidepressants work by increasing the amount of serotonin in the brain, but L-Tryptophan does so naturally and without a prescription. However, altering the levels of serotonin in your body can cause a host of potentially dangerous side effects, so be careful with your dosage and make sure you tell your doctor before you use L-Tryptophan to reduce symptoms of depression. Wondering about which brain supplements contain L-Tryptophan? Check our brain supplement reviews!